Shown here is a couple of photos forwarded to me from Canada is a classic IH TD14. Without knowing much about it, I would date it to the early 1950's. The TD-14 used a 4 cylinder version of engine used in the TD-18 (which had 6 cylinders). It was a start on gas/switch to diesel hybrid popular with IH. The sparkplug was hidden behind a 3rd valve in the head. When the valve was open, the compression ratio was lower and the spark ignition system could work. Closing the valve with a hand lever and opening the diesel throttle accomplished a switch to diesel fuel. 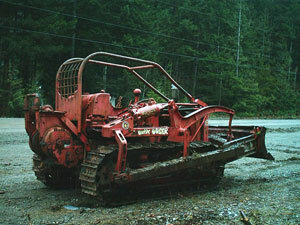 This was the IH alternative to using a gasoline pony engine to crank the diesel as Cat did. 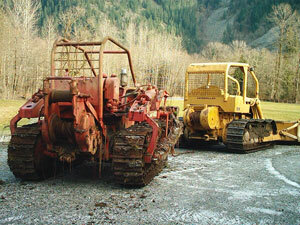 Other notable features of this machine include the after market hydraulic blade assembly by Bucyrus Erie. As was characteristic of crawler tractors of the day, they were envisioned as 'farm tractors' pulling things, and did not have a 'hard nose'. That is to say the engine stuck out in front in the middle but wasn't reinforced to be structural. For example in the Cats of the era thte engine was cast iron as was the radiator and the radiator was simply bolted to the front of the engine via cast iron 'water passage ways'. 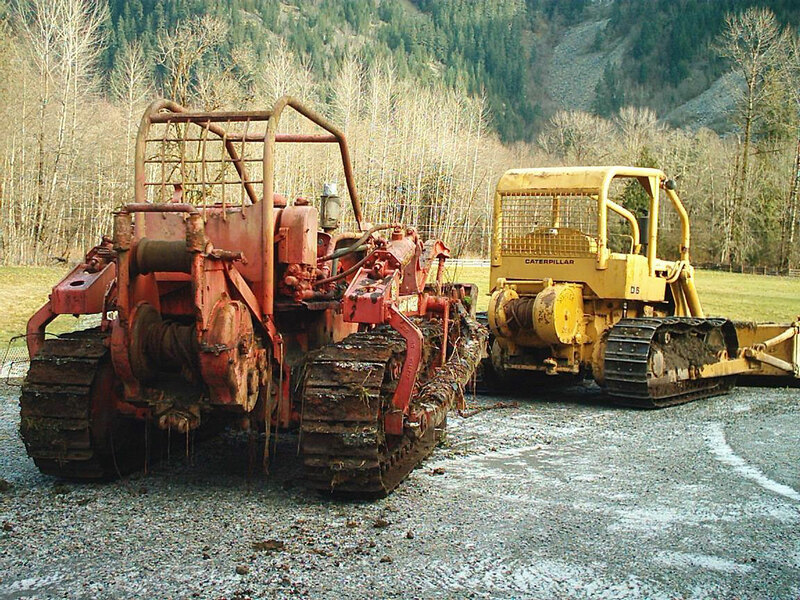 This precluded hooking the blade lifting mechanism to the front of the dozer. While this machine may have some frame suitable to support the radiator, it isn't enough to support the blade. Because of this, it was necessary to attach linkages such as you see here to the swingframes to lift the blade. The winch is a classic Carco winch with the elevated fairlead added by some welder after the fact. This sort of a which is PTO driven with the gear train to the drum on the robust right side of the winch. Unlike Hyster who often used an internal expanding brake, Carco typically used an external band brake on the left side which was effectively a 1 way brake. You could wind up through it, but it would hold the other direction. Some models had a 'pull pin' that allowed you to disconnect the gear train so you could unwind the cable by hand while others did not.